I have an error as Goal background doesn't change but only font color changes. Can you help how to resolve this issue? All you need to do is to go into Settings (click the 'cog' button at top right of the Goalscape Online screen) and select 'Full fill goal coloring' (see screenshot). 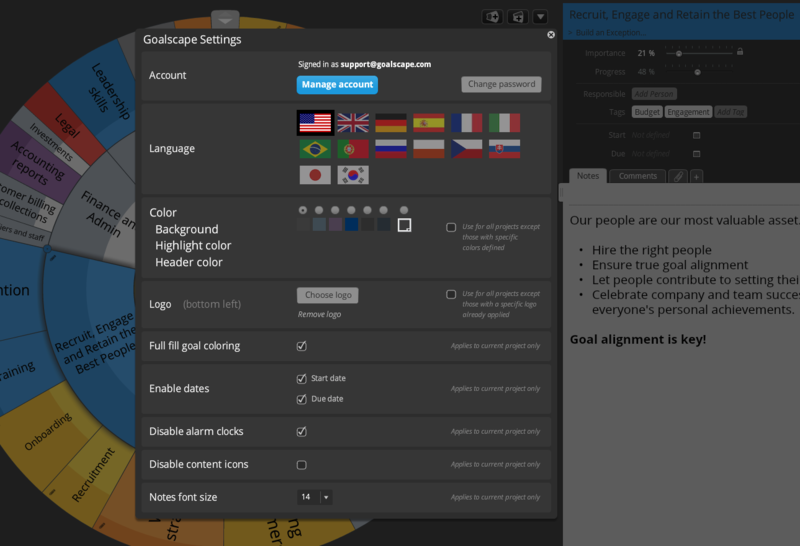 In fact this option should be selected automatically as soon as you apply any color to any goal. So the most likely explanation for you seeing the 'outline and goal name coloring' view is that you selected a color then de selected that 'Full fill goal coloring' option in Settings. If that is not what happened here, please post details so that we can investigate.